Very active, the entities in the Vhm Group are constantly developing new products and services to bring them closer to you. List of trade fairs and shows in which they will be participating. Vhm : a set of complementary skills and activities. The Vhm Group puts its more 90 years of experience at your service. 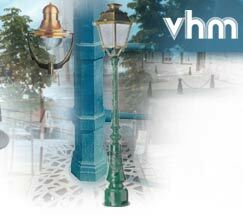 Vhm Éclairage : lighting masts, lighting columns, cross pieces, bouquets, brackets, cast iron or steel, contemporary or traditional in style. A vast range of products for decorative street lighting. Vhm Mobilier urbain : all types of urban furniture : car park bollards, tree grates, fountains, benches, railings, litter bins, accessories. Browse our on-line catalogue. 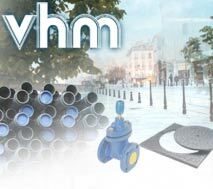 Vhm Canalisation : specialising in piped water supplies, drainage, roads, tools. Our specialists are available to help public works companies and local authorities. Vhm Fonderie : Cast Iron (EN-GJL 200, 250 et 300), Ductile Iron (EN-GJS 400-15, 450-10, 500-7 et 600-3), Allied Cast Iron and other grades on request. Prototype, unitary, little, medium and large series. Machining and mounting.